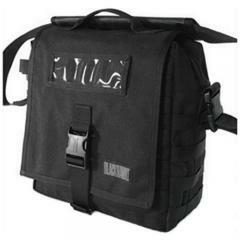 The Blackhawk Enhanced Battle Bag is an updated version of their popular Battle Bag, equipped with modular technology for enhanced versatility. It is also slightly enlarged, allowing it to carry a laptop computer. It is made from wear-resistant 1000 denier nylon, and features stiffened sides for increased structural integrity. Its shoulder strap features a HawkTex-coated pad for comfort and non-slip stability. The bag's internal divider makes it easy to organize your equipment, while extensive S.T.R.I.K.E. webbing over three sides and heavy-duty D-rings allow you to attach pouches and accessories to customize your bag. The top flap includes a large map pouch for documents, and can be removed entirely for use as a stand-alone case.